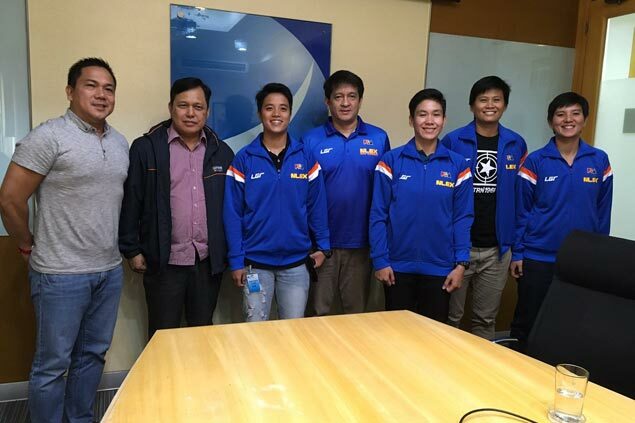 NLEX's champion team in the PBA women's 3x3 league call on MPTC president Rodrigo Franco. With the team are NLEX team manager Ronald Dulatre and coach Raymond Celis. AN official of Gabriela has condemned what she described as a 'discriminatory' move by the PBA disallowing women's players from sporting boy-cut hairdos in its women's 3x3 league. Rep. Emmi De Jesus said a player's hairdo should never be a bone of contention in sports as she expressed puzzlement over the rule contained in a memo released by PBA commissioner Chito Narvasa. “Bawal ang boy-cut hairdo? Bakit daw? Syempre naman discriminatory 'yun. Sports nga eh, ibig sabihin okay ka at (fair) ka,” said De Jesus. De Jesus said sports institutions should never craft rules that discriminate against sexual preference. "Kahit ano pa siya, kahit na lesbian pa siya, walang dapat kaugnayan ang sexual preference at lalong walang kaugnayan ang haircut sa isang sporting event,” said the three-time party list representative. De Jesus said the 'no boy-cut hairdo' rule shows double standards in a league which do not apply the same restrictions on haircuts to its male players. “Kawawa yung mga babaeng players in their pursuit of self-expression. May mga lalaki ring (players) na nagpapahaba ng buhok, binabawal ba nila yun? I think no,” she said. De Jesus said the women's rights group is willing to help players to be disenfranchised by the PBA rule. “Pinakamaganda riyan makausap namin ang mga stakeholders (at players). We welcome kung sila ay lalapit sa amin para ilaban ang ganitong pagtingin,” said De Jesus. “Nakakaawa yung mga atleta na mafo-force magpahaba ng buhok at kung gagawin nila yan ng labag sa kalooban nila, pinakamaganda, gumawa sila ng statement at kung kailangan nila ng suporta, we are open (to help) naman,” she said. “Hindi sila kailangang matakot,” she added. So far, no statement has been released by the PBA after Narvasa’s haircut code came under criticism on social media sites. But different players who disagreed with the order of the commissioner told SPIN.ph that officials from the PBA have asked them to send statements supporting the directive of Narvasa. “May mga nag-text nga po sa amin, sabi nila magpadala raw kami ng message o quote para ilalabas nila as press release sa mga dyaryo to counter 'yung story nga,” said a player who requested anonymity. “Yan nga po dahilan kaya hindi na rin ako nagpa-unlak ng interview sa inyo sa story ninyo nung Friday, although gusto ko po sana kasi pakiramdam ko nava-violate ang karapatan ko for self-expression,” added another player. The women's league is set to hold tryouts for a new tournament on June 20.